Price is for each. May fit other years and models. I want to make clear that the part that you are looking at is used. All of our parts are removed from used and salvaged vehicles. Unused and un-tampered with. 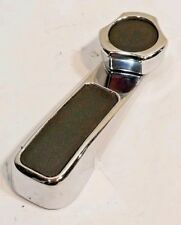 Interior door window crank open handle, not immaculate but overall nice condition. Any attempt to disassemble or modify the part will void the warranty. Our warranty is for PARTS ONLY. Unused and un-tampered with. Fits many years. Any attempt to disassemble or modify the part will void the warranty. Our warranty is for PARTS ONLY. Unused and un-tampered with. 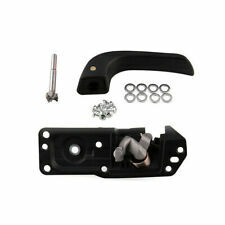 2007-13 Chevy Silverado 1500 (excluding LTZ Models) Front Driver Side. 2007-13 Chevy Silverado 1500 Crew Cab (excluding LTZ Models) Rear Driver Side. 2007-14 Chevy Silverado 2500 HD Crew Cab (excluding LTZ Models) Rear Driver Side. P/N ： 080670800. Condition ： NEW (Never Used). it was already "Sticky" when I received it new from Italy, so I decided to repaint it Japan. Item Condition: USED and in Great condition. Johnny Law Motors billet window cranks take interior customization to a new level Featuring 5 distinct and stylish designs, our billet window cranks replace or upgrade your current window cranks to the high-end look of billet Use them for manual setups or in conjunction with an Johnny Law MotorsElectric Window Switch to control your power windows Featured on several TV shows including Monster Garage, and Pimp My Ride Johnny Law Motors kits deliver where all others fails. Insist on the best, and insist on Johnny Law Motors and you be glad you did. Any attempt to disassemble or modify the part will void the warranty. Our warranty is for PARTS ONLY. Unused and un-tampered with. Pair of OEM window cranks - one side is missing plastic insert. otherwise in good shape. AutoLoc Power Accessories. Insist on the best. and insist on AutoLoc and you be glad you did. AutoLc billet window cranks take interior customization to a new level! Featuring 5 distinct and stylish designs, our billet window cranks replace or upgrade your current window cranks to the high-end look of billet! We Are An Official Dealer For AutoLöc ~ Ships From USA! May fit other years and models. I want to make clear that the part that you are looking at is used. All of our parts are removed from used and salvaged vehicles. Unused and un-tampered with. Any attempt to disassemble or modify the part will void the warranty.